I’m traveling for the next few days with Tom Phillips (a Kiwi living in London) and his partner Rowena. Tom’s Dad and my Dad were taken POWs in Kalamata. We had arranged the meet-up through the Stalag 18A Facebook page. We take a taxi to Athens’ busy KTEL bus station hub in Kifisia because despite the amazing public transport systems in the city the intercity bus station is served abysmally. We pass an amusement park and I say, “I never saw that in any tourist guides.” Yeah, well, Athens is not the Gold Coast after all. The seats on the bus are comfortable and the trip so fast. 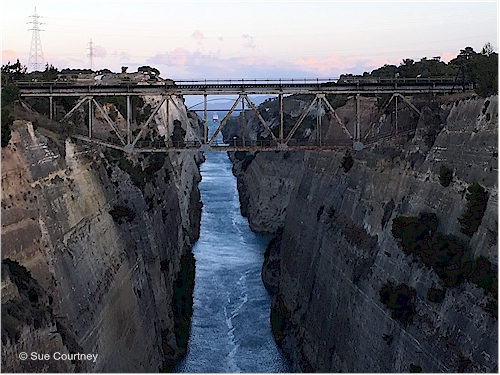 So fast the driver forgets to stop at the Isthmus station just after we cross the famous Corinth Canal. ’Hey …,” I yell. We are staying at the Prime Isthmus Hotel for the next two nights. Perfectly positioned for what we want to do. The Trip Advisor / booking.com / etc reviewers are too harsh on this hotel. I loved my room with private balcony to hang out washing and view over the Saronic Gulf. The first thing I do is walk to the canal, some 300 metres away, and take it all in. Tomorrow I will be on the water below looking up at the bridge. 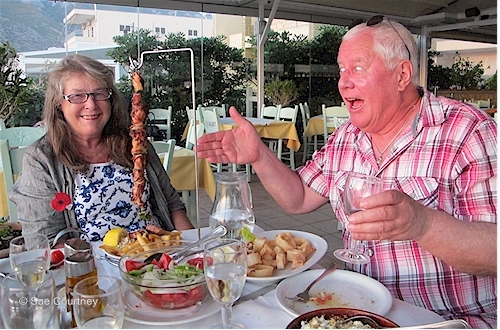 We dine at a restaurant in Loutraki on Gulf of Corinth to the east of the canal. I wanted to go here because Neil and I loved the look of this seaside resort when we passed through here in 2013. Once again Tom and Rowena suggested I order the wine and I bet they regret it because the wine list had only the producer names. “You want red or white?” asked the man. Those of you who know me will get the gist of what consternation/conversation this produced. Only wine geeks will appreciate. Eventually I was allowed to go and see the bottles. I chose the 2015 Domaine Gerovassiliou (a blend of Malagousia and Assyrtiko) because I know their wines are modern and clean and also because they answered my email and I am going to visit them next week. The food tasty but the generous portions a little more than my appetite could handle. The sunset, for a second night in a row, amazing. We order a taxi back to the hotel. I take the driver’s business card. 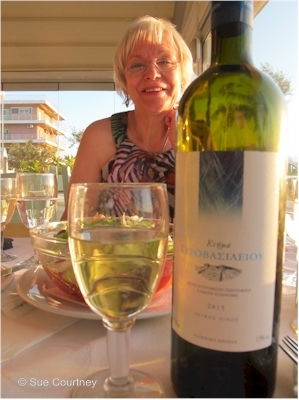 This entry was posted in Greece, Travel, wine and tagged Corinth, Isthmos, Loutraki, POW by Sue Courtney. Bookmark the permalink.